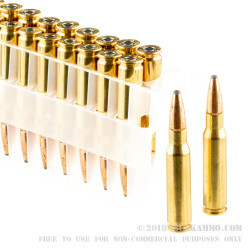 Hone in your sights with these .308 Win Ammo by Federal. These Power Shok rifle loads will give you accuracy and power at a wallet friendly price! These are a hard hitting round that is perfect for hunting and will give you the action you want when it counts most. Federal is a staple in gun safes around the USA and always provides quality you can count on. Founded in 1922, Charles Horn took control of a small plant in Anoka, Minnesota and the Federal Cartridge Company was born. The company went from meek beginnings from peddling their wares in barber shops, filling stations and grocery stores, to being one of the largest manufacturers in the United States. Now housed on 175 acres and with half a million square feet of manufacturing space, the company employs nearly 1,400 residents of Minnesota. These medium to large game rounds have a muzzle velocity of 2820 feet per second. They are brass cased, boxer-primed, non-corrosive and reloadable. 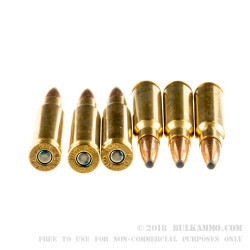 The 150gr rounds feature a soft point bullet. Soft points are designed with a soft metal core surrounded by a metal jacket that is left open at the point. They expand upon impact creating a larger wound diameter. .Great Ammo, 150 grain is just right. Good quality ammo at a decent price. Accurate, easily fed / ejected and no jamming issues! !